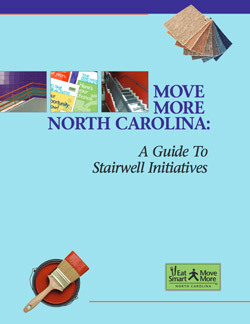 Move More North Carolina: A Guide to Stairwell Initiatives is a useful planning tool that provides step-by-step guidelines for anyone interested in implementing a stairwell initiative. The guide also provides links to downloadable promotional signs and examples of stairwell initiatives in place across North Carolina. Stairwell initiatives promote using the stairs as a way to incorporate physical activity into daily life. Taking the stairs is encouraged through a variety of physical improvements including paint, lighting and artwork, as well as point-of-decision prompts such as promotional signs. 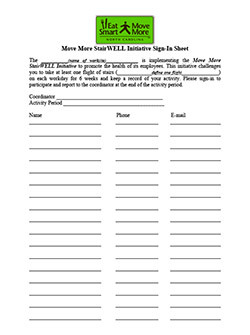 Stairwell initiatives are being adopted by organizations across the state, including the N.C. Legislative Building, and are a great way of incorporating physical activity into the workday of employees who work in multi-floor buildings. Download the full set of 28 posters as a .zip file here, or see below for individual posters.